The screenshots don't really do this thread justice, so allow me to elaborate. I got a little overzealous with turtle farming and Fleet Smasher found (correct me if I'm wrong) 105 hades and a handful of hercs returning from someone I had just hit. For me it's another night of smashing turtles for profit. 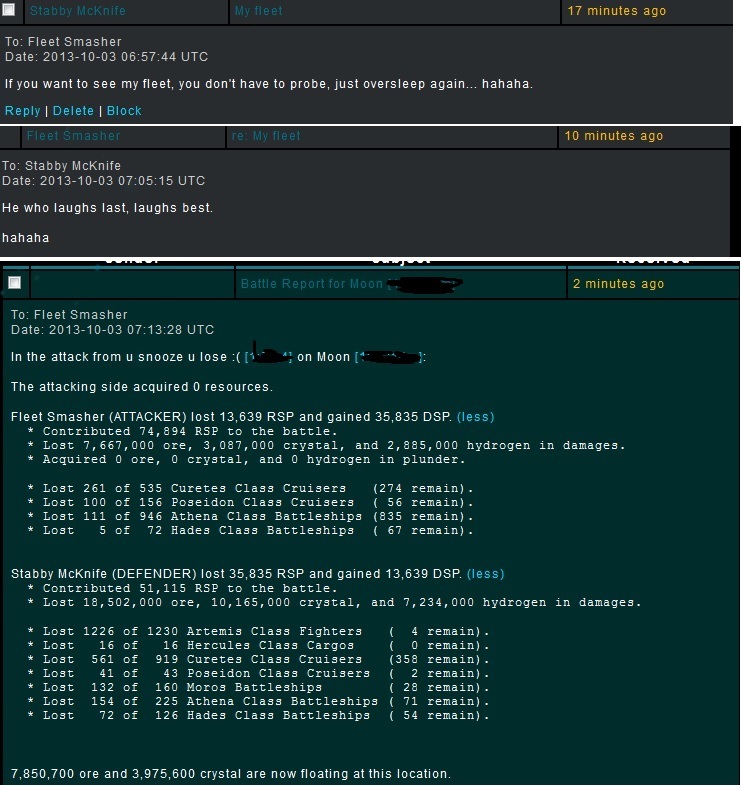 I look away and look back and Fleet Smasher is 4 mintues out with an oracle lock on my 105 hades. I had several returning fleets that his probes didn't see, the fight was on my doorstep, and I know from experience with "fast" oracle locks the defender has all the time in the world to scoop debris (me). Having killed his fleet the day before, I was willing to take another one for the tourney, to try to again take this monstrosity down a notch. After hasty calculation on my part, I decided to fight him, and got beaten a little worse than I thought it would be (was expecting closer to 60/40 losses). I had more curetes than him, more hades than him, and given his ratio of athena + posi compared to curetes, I was expecting a much larger (but not larger than mine) loss on Fleet Slayer's part. If Wargasm is Stabby does that mean Stabby is Wargasm?